Happy hour is a typical after work go-to. It's affordable, right? But it gets old after a while. How many times can you down a Cadillac Margarita a week without adding inches to your waistline? Lucky for you, there are many more post-work activities you can take part in sans the $1 tacos and endless baskets of chips and salsa. If you've never done yoga before, girl, you are missing out! Here's the thing: you don't need to make an ordeal out of it by booking class time or becoming a yogi master. All you really need is a yoga mat and a place to practice. Everyone has that special spot outdoors that makes them happy like a park with fragrant blossoms, or a lake/beach that is beyond majestic. 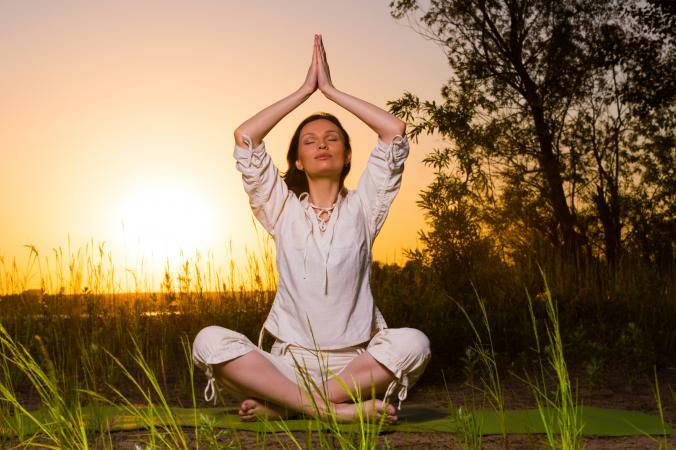 Get your inner "Om" and peacefulness on by yogi-ing in your spot. Bring your friends too! Ecotherapy (or getting your bum outdoors) is beneficial to your physical health and mental wellbeing. Not to mention, yoga can also have a positive effect on blood pressure and relieves anxiety and depression. Grab some essential oils to put on your pressure points so you can breathe in more serenity, upload a yoga session on your smartphone, and let nature do the rest. This is a great way to stimulate your mind while improving your physical fitness. Find a fun sport like squash, sign up for a bowling club, or even join a slow-pitch softball team. Then play to win! Not only will you release endorphins off the charts, but you might find some lifelong friends in the process. After a few sessions or practices, this will become part of your routine--that you look forward to. It's enjoyable to meet with people you like and come together for a common goal. Scoping out these activities also gets your mind off of the daily grind you experience at work. You might even get a trophy to proudly display. Pretty awesome, right? Do you have an idea that has lived in your brain for years, but you've never pursued it? Whether it's an app idea, a blog, or a small side project--make it happen! Instead of downing drinks after work, you can put your time into productivity by starting a passion project that brings in additional income down the road. Starting a small business or bringing an idea to life brings you a sense of purpose because you are building it from the ground up. It doesn't have to require a ton of time and money either (thank goodness). If you want to be a dance instructor at a studio that has a steady base of clients--do it! Creating a blog is also simple, thanks to sites like Wordpress. You can even put together a simple site to sell that mountain of crafts you're always making. Who knows, maybe this will become a major career move in the future. You can even enlist a friend or co-worker to join in and help you out. Who says you can't bring the party home? Invite your gal-pals and host a potluck. You can even theme it out--who doesn't want a homemade Mexican food night on Taco Tuesday nights for a fraction of the cost? How about an Arabian Nights…night? Have someone claim the couscous or baklava, another put together some shish kabobs, and someone can bring the Middle Eastern tea. You can also put on a movie in the background (hello, "Aladdin" anyone?). Sing those classic songs with some tasty food in hand with your circle of BFFs. Ok, this doesn't mean drop a bunch of bills on dinner. Scope out some restaurants for appetizers. You can even restaurant hop to try a couple finger foods from those places you've always wanted to try. Another way to do this is by finding a craft market or art walk to go to then popping into some quirky places for a light nosh. Have your co-workers, girlfriends, or significant other tag along. 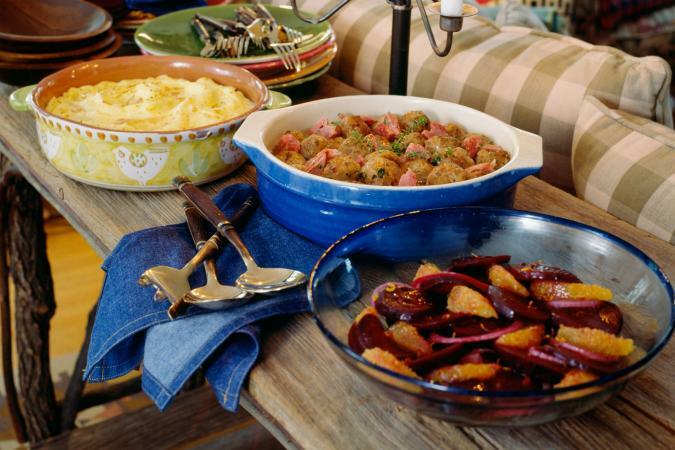 You can even choose a couple places to visit and become food critics for the evening. Cast your votes to see which location is the majority favorite. You'll probably end up incorporating a bunch of places to your usual foodie rotation. Maybe you're not the Van Gogh of our times, but who cares? Get a few laughs in when your palm tree ends up resembling some sort of reptile-looking…thing. Pick up a paintbrush, a sketchpad, or even some ceramics and tap into your inner Picasso. 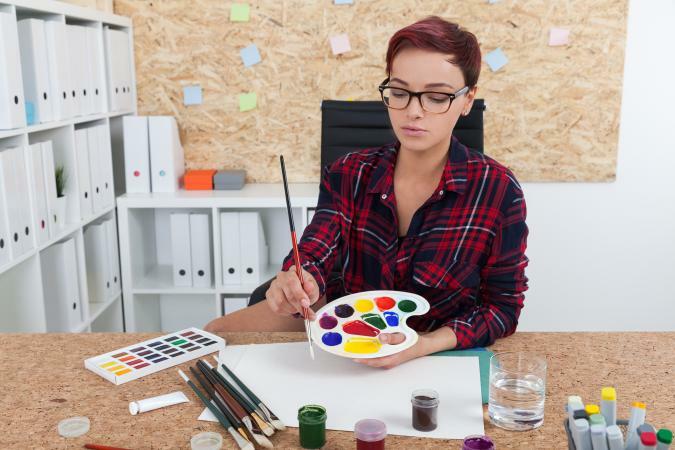 Art relieves stress and boosts your mood, despite your talent level. Plus, wouldn't it be neat to frame and hang a picture on your walls that you're actually proud of? It's an achievement you can look at every day! Plus, hearing compliments from others about your work is pretty amazing too. Learn about those complimentary colors and abstract expressionism and then get those creative juices flowing! So many of us have a stack of books that are "on our list" to read, but we never seem to find the time to dive into them. Instead of spending a few hours at happy hour, you can pour yourself a glass of wine, light a candle, wrap yourself in your most comfortable blanket, and catch up on your unread stack (that sounds so good). 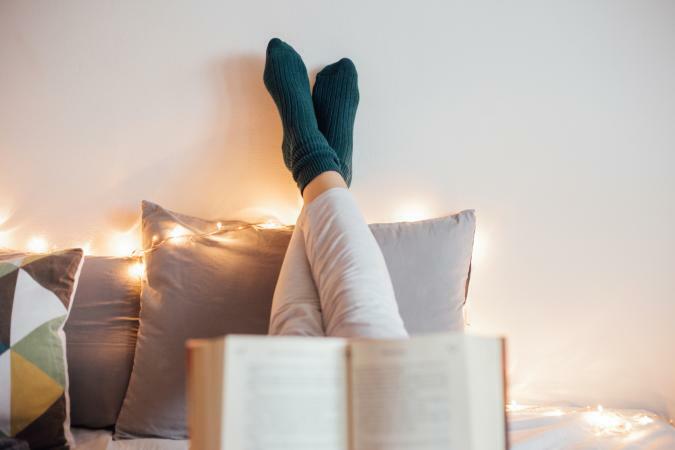 Keep in mind, the blue lights involved from reading off a screen right before bedtime can affect your sleep for the negative, but printed books will soothe your mind into a restful place. You can even put some light music on in the background to complete the peaceful setting. You're pretty much pampering your brain if you really think about it. Sure you could spend some money, but you can also go window-shopping too. If you love, love, love a certain store, drop by and check out some of their new merch. Set some goals for an item you want to buy. Pull a, "If I'm good with my spending by the end of the month, I am so getting that adorable fall sweater and matching bangle because I deserve it!" situation. Give yourself that much-needed pat on the back for a job well done (you work hard lady! ), and give into those emotionally satisfying impulses. Maybe you don't need another handbag, but if you want it, why not? Just make sure you aren't putting yourself into debt by making a major purchase every single time you're heading to the mall. Remember, you're window-shopping (emphasis on the window).